Taken from the National Register of Historic Places Inventory Nomination Form prepared by Joseph J. Peters, M.D. on January 20, 1971. 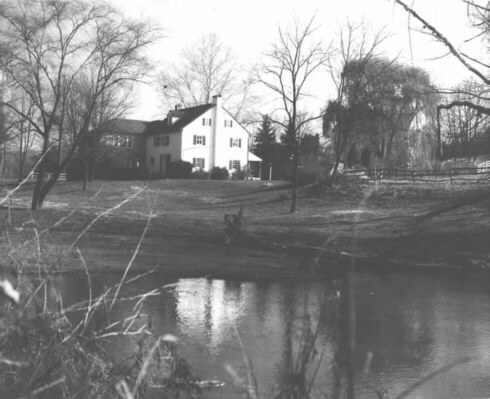 Custer's Fulling Mill & Skippack Creek Farm, by Eva Boswell, Historian, Skippack Historical Society, Valley Forge Picket Post, Oct. 1970. Historical Relationship of Germantown and Skippack, J. Petters, M.D., Germantown Crier, Vol. 22, No. 2, Spring 1970, pg. 57-60. History of Montgomery County, Bean (Theodore W.), Everts & Peck, Phila. 1884 pg. 1020 -- Hermanus Kuster & John Kuster. View of the Kuster House as it appeared in 2003. 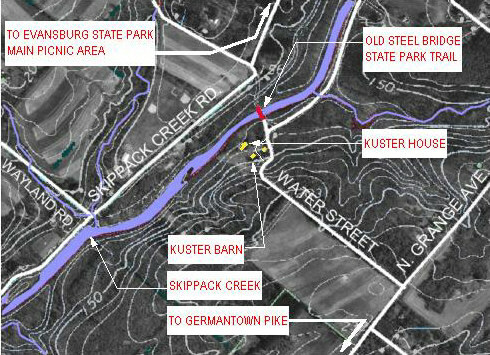 Aerial Map of Kuster Property (Map by Brad DeForest) Hiking and Horse trails pass right by the property along Skippack Creek. The mill races on this property are intact. These were stone lined. The house and cool cellar were built of stone taken from the quarry located on the property. Kaulus Kuster, (sic) the first Kuster clan was a mason in Germantown in the seventeenth century. The house and premises evidence the residence of competent stone masons. The basement and cool cellar floors are covered by large flags of stone. The original part of the dwelling uses the local redbrown rock as evidenced in the facade of tailored or dressed courses of stone. Fenestration consists of four windows across the facade. The house has a central chimney with corner fireplaces as found also in Germantown homes. Alterations in the roofline have occurred. It is possible that the house once had a gambrel or hipped roof. The present fulling mill addition replaced the original burned in 1936. An open spring is located in the basement of the house suggesting that this structure also might have had a part in the fulling operation. Certain alterations of the roofline can be traced. 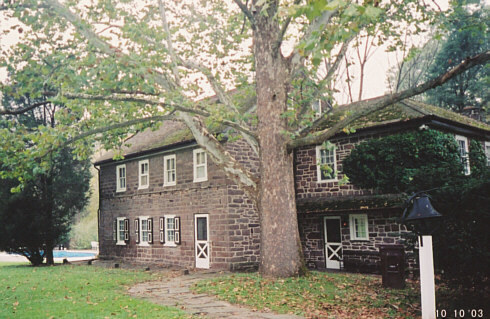 Statement of Significance: Skippack Creek Farm and Fulling Mill was originally sold by Mathias VanBebber to John Krey on December 25, 1702. By 1706 when the deed was recorded in Philadelphia, there were messuages, houses, building and other improvements. Hermanus Custer purchased it April 20, 1717. PEGGED DUTCH BANK BARN -View of the Kuster Barn as it appeared in 2003. The land borders the Skippack Creek in a bucolic setting. 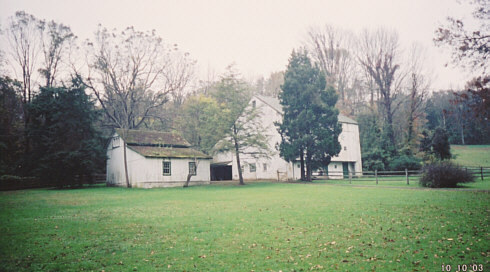 A stone house, pegged Dutch bank barn and fulling mill exist on the property (the mill structure doesn't exist anymore). The datestone for expansion of the house to the present size by John Custer bears 1767. This is no doubt the first fulling mill in Montgomery County, if not in the State. The house was the first in Montgomery County with indoor water, it was built over a spring providing water and a cooler for milk and food. Title searches revealed that an unusually large number of property owners in the Skippack area had a trade besides farming; the occupation of weaver occurs frequently. Historic documentation corroborates that many of the purchasers stemmed from the Krefeld region, one of the leading European textile centers in the eighteenth century. A blue dyer's establishment was operated alongside the fulling operation. The 1756 census of Skippack taken by Walter Johnson includes one fuller, John Custer. In summary, the house merits attention because of its age, its connection with the personages of a Paulus and Hermanus Kuster and the Germantown complex as well as for its technological significance as and early and unique industrial site. View of the Kuster House from across the Skippack Creek. This photo was taken back in the 1970's.